Bruce Darby and Matt Deivert drove the 5 hours to attend the 2017 Green and Growin’ show in Greensboro, NC. Although not as large as MANTS, this show is well-known as a ‘growers’ show. 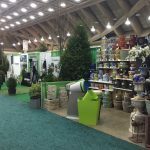 It allowed us to follow up with several vendors from MANTS and to see some smaller growers that did not attend that show. The mood was optimistic overall, but the shortage of shade trees, larger evergreens, inkberry and boxwood still has buyers and sellers concerned. Twenty-seventeen will be the year to substitute with what is available; fortunately SRN has over 30,000 shrubs and 9,500 trees secured for spring and more lined up for after the flush.